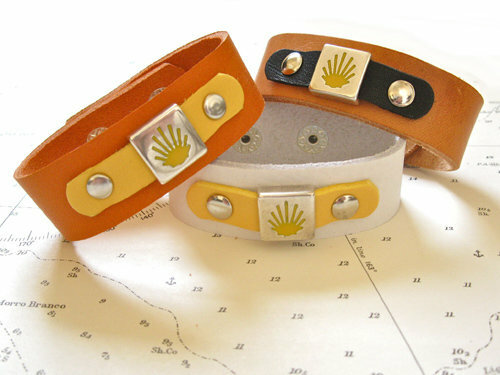 This natural-leather bracelet illustrates all that is pertinent about "El Camino" - simplicity and meaning. The bracelet features the yellow stylised shell symbol of Santiago de Compostela from the Way of St James - the famous pilgrimage walk / route through Spain. Dimensions: The bracelet is 20mm wide and available in a choice of colours: Please choose in options box. Please NOTE: We use real leather for our Camino bracelets - so sometimes colours can vary a bit from the photos. Do you want to encourage and support your friends or loved-ones as they walk life's camino and face its challenges? Let us send this hand-crafted leather bracelet on your behalf to show how much you care - a symbolic bracelet. The 1,000-year-old Way of St. James (El Camino de Santiago - in Spanish), criss-crosses Western Europe, arriving at Santiago de Compostela in Northern Spain on the Atlantic coast. At least 200,000 people travel to the city each year from all over the world: Some people walk, others travel by bike. Many travellers choose to do the Camino for personal, rather than any spiritual or religious reasons - taking time out from their busy, modern lives and perhaps finding inspiration along the way, whilst reflecting on their lives in a supportive environment. Many carry with them a Waymarker symbol like on this bracelet.. Everyone experiences the journey in a different way. Show someone that you really care and that you are thinking of them with this lovely Camino cuff bracelet. Comes gift-wrapped, like all our presents - and we can print a personal message on your behalf.